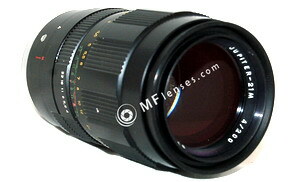 This lens in production long time ago, this time still available as brand new from many Russian sellers. My copy also one of the latest MC version with auto and manual mode.I thought based on the pictures what I found on Pbase.com this should be an interesting quality lens. Very good lens optically, pretty sharp one f stop down and colors are great. Lens optical quality is comparable with other much more respected lens like Carl Zeiss Jena or Pentacon lenses. Bit heavy lens with almost 1 kg ! , but acceptable , usable lens. I not like much auto manual switch , because very easy to push into wrong position under focusing. Slow lens and not very sharp at wide open this the minus. You can pick up this lens for affordable price, real value for money.